Do you have an elder in your family who has stories to tell but few members of the family have heard them? Would you like to learn how to record and preserve the stories of struggle and triumph of your parents or grandparents for your own children and grandchildren to know? In partnership with the Asian Library, the Pacific Canada Heritage Centre is offering a two-part workshop in April and May. Learn how stories are gathered, and how the histories of Asian migrants to British Columbia and Canada can be exhibited as an heirloom for generations to come. 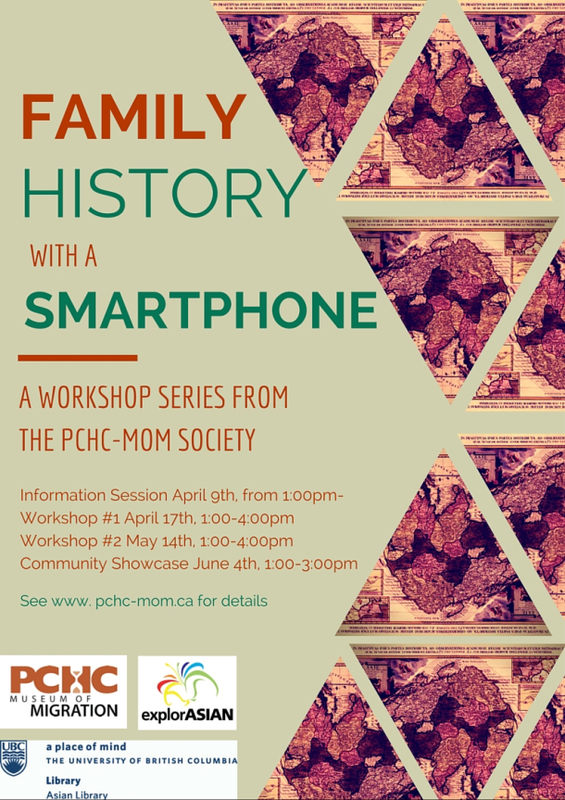 For more information, please visit http://pchc-mom.ca/2016/03/21/family-history-with-a-smartphone-a-workshop-series/. PCHC’s “Family History with a Smartphone” workshop series is a part of explorASIAN 2016, a month-long festival of Vancouver Asian Heritage.